Gul Panag wears multiple hats with ease. Acting, modelling, marathoneering, road tripping, car and motorcycle award jury panelling, animal loving, brand endorsing and politicking are some of the myriad roles she juggles with elan. Of particular interest to you, our reader, and us at CarToq will be the cars and motorcycles that this lovely lady owns. Today, we take your through a Gul Panag’s well rounded car and motorcycle garage. Gul Panag drove a heavily customized Mahindra Scorpio Getaway pick up truck to the frigid heights of Ladakh and back, as a part of the Discovery Channel’s “Off Road with Gul Panag” programme. Jaskirat Nagra of Sarbloh Customs, Mohali, put togethet the custom Scorpio Getaway, which among many things features a roof top tent and chemical toilet. So, if you’re looking for an expedition ready platform and someone to put all of it together for you, you now know whom to get in touch with. Hero Motocorp, then Hero Honda, brought the BMW F650 Funduro dual purpose motorcycle to India way back in the 1990s. A 4 lakh rupee price figure was then deemed too pricey by most buyers and the Funduro died a quick death. However, most of the Funduros that Hero Motocorp sold still survive, thanks to the robust engineering from BMW Motorrad. A keen motorcycle enthusiast, Gul Panag owns a F650 Funduro. The motorcycle’s single cylinder, 650cc four stroke motor puts out 48 Bhp. Did you know? Gul Panag owns a green home? Well, she spent quite a fortune and her time building it somewhere in the western ghats between Mumbai and Pune. 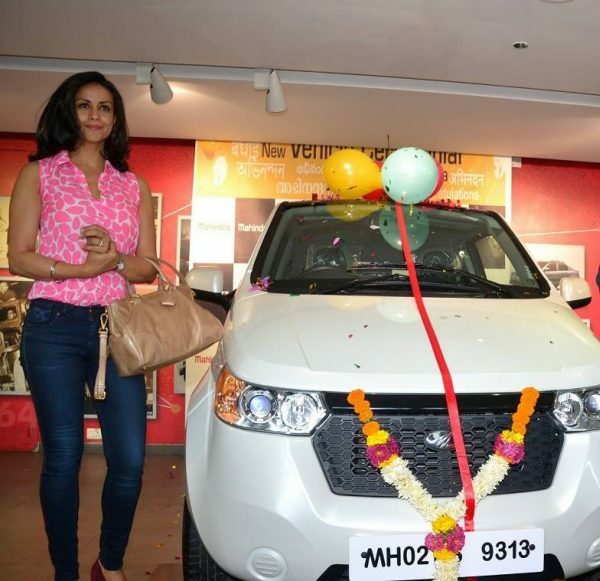 Adding to her green credentials, the actress’ pilot husband Rishi Attari gifted her an E2O, India’s only all-electric hatchback from Mahindra Reva. The E2O is a perfect city runabout for those who do less than 80 Kms a day. The electric car has a CVT automatic gearbox, which means that driving one on city streets is a breeze. 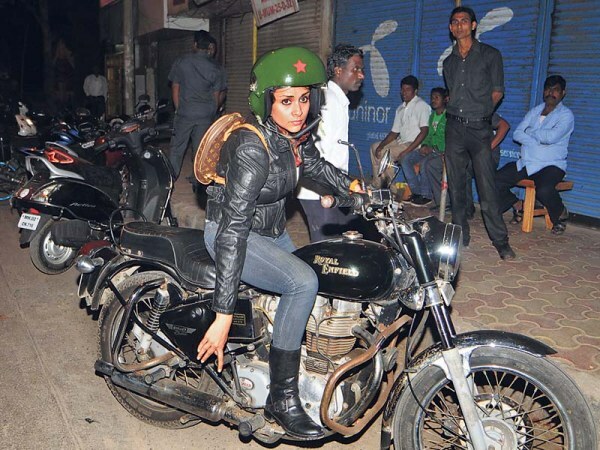 For a lady whose wedding procession included a Royal Enfield Bullet with a side car, Gul Panag still has a Bullet to ride around town. The actress has been frequently been spotted riding her Royal Enfield Bullet Electra, replete with the 350cc cast iron engine. In the past, Gul Panag has admitted that she’s still in love with the thump that only a cast iron engined Bullet can deliver, while conceding that the newer unit construction engined Royal Enfields are far more reliable. This is one lady who really knows her set of two wheels. A Brand Ambassador for Audi, Gul Panag now drives an Audi Q5 luxury crossover. Previously, the lady’s luxury drive was a BMW 5-Series 520D sedan. The Audi crossover offers a better ground clearance and bad road handling ability than the Bimmer, which is a far superior when it comes to high speed dynamics. The actress has also owned a Mahindra Scorpio before.